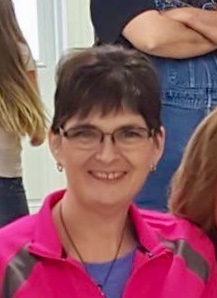 Beverly Roberts, 55, of Loogootee, passed away at 8:54 a.m. Sunday, June 17, 2018 at her home surrounded by her loved ones. She was born June 6, 1963 in Jasper, Indiana to Richard and Marjorie (Street) Divine. Bev was a member of the Mt. Zion Wesleyan Church. She loved her grandchildren and cherished every moment she spent with them. She was preceded in death by a granddaughter, Chasity Clark; sister, Sherri Holt. Bev is survived by her husband of 35 years, Tony Roberts, of Loogootee; children, Becky (Jeremy) Clark, Nick (Lacey) Roberts and Tiffani (Anthony) Sergent, all of Loogootee; grandchildren, Jordan and Candice Clark, Connor, Remington, and Paisley Roberts, Chase and Noah Sergent; parents, Richard and Marjorie (Street) Divine; siblings, Peggy (Craig) Bullock, Rick (Mary) Divine of Freedom and Rod (Angie) Divine of Washington. Funeral services will be conducted at 7:00 p.m. Wednesday, June 20, 2018 at Blake Funeral Home in Loogootee. Visitation will be held Wednesday, June 20, 2018 from 4:00 p.m. until the time of service at the funeral home. Memorial contributions may be made to the Travis Burkhart Foundation.